In my quest to run an endurance race in all 50 States, I often ask other runners for race recommendations. When it came to Oklahoma, the universal opinion was that the Route 66 Marathon/Half Marathon in Tulsa was THE race to run. Two weeks ago I ran the Route 66 Half Marathon. I have to agree – it is a terrific race. 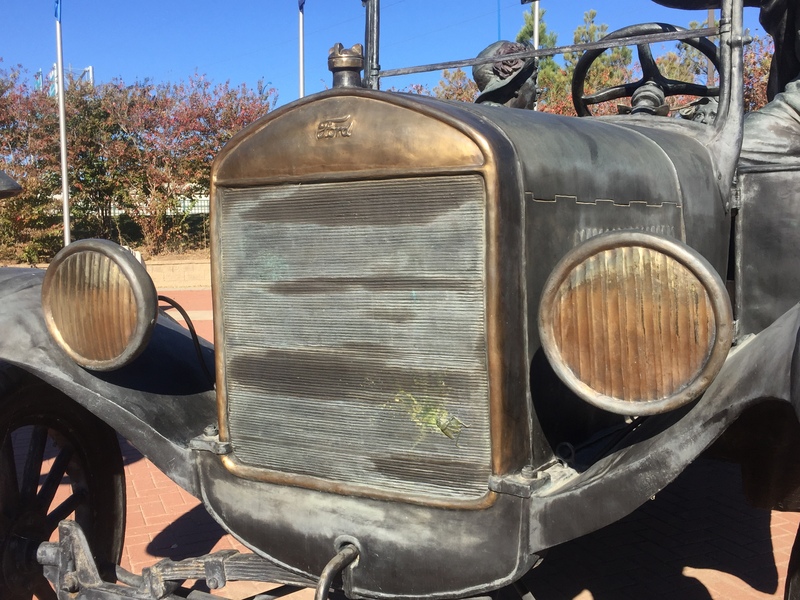 I didn’t know much about Tulsa or US Route 66 before I went there. I knew there was a television series in the 1960s called “Route 66” and a song in the 1940s titled “Get Your Kicks on Route 66”. 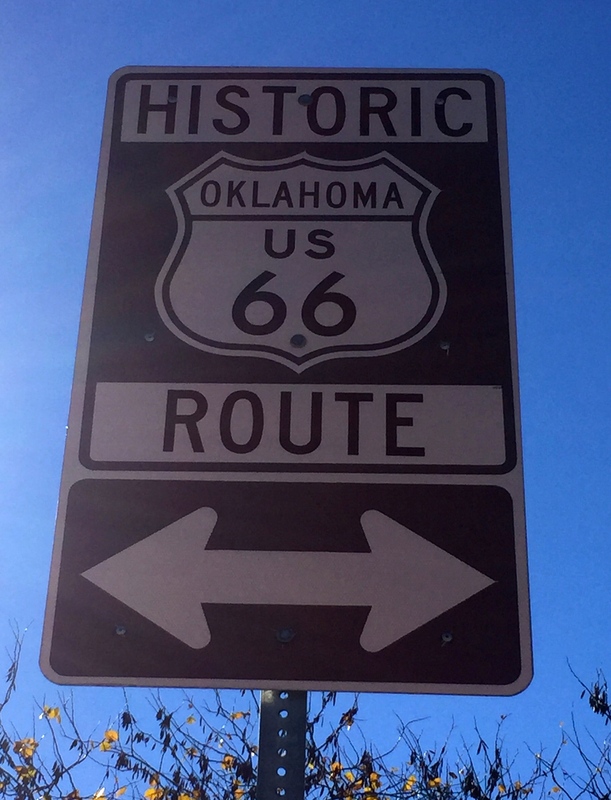 I did a little research and learned US Route 66, also referred to as the Mother Road, was established in 1926 as one of the first highways in the US. It spans over 2,400 miles from Chicago, IL to Santa Monica, CA. 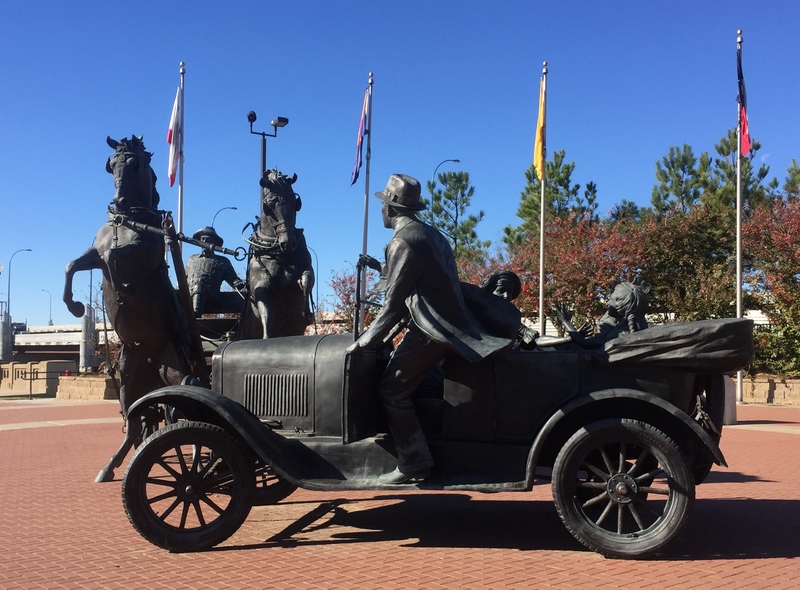 In the early days of automobile travel, if you wanted to head west to California, either as a tourist or to seek new opportunities, you’d travel on Route 66. 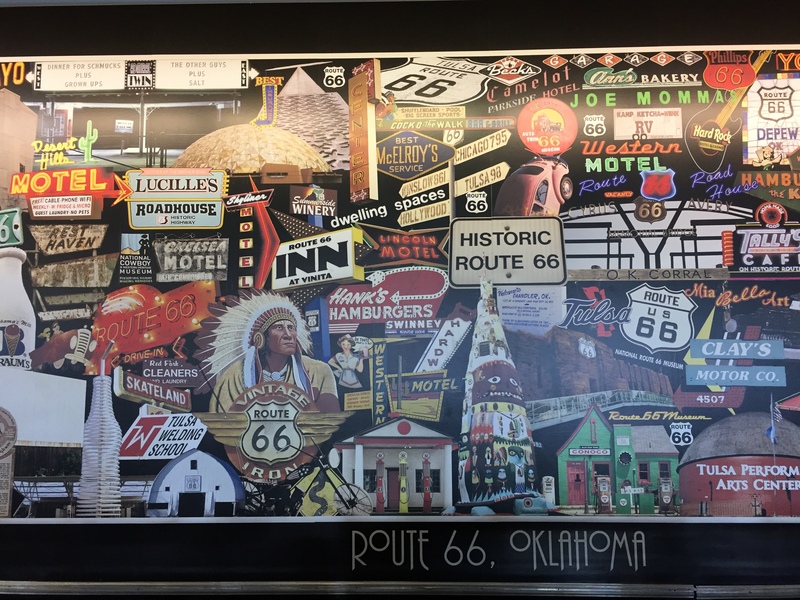 Tulsa has the longest stretches of Route 66 that pass through a metropolitan area. It seems fitting that a marathon in Tulsa should be inspired by and named for Route 66. 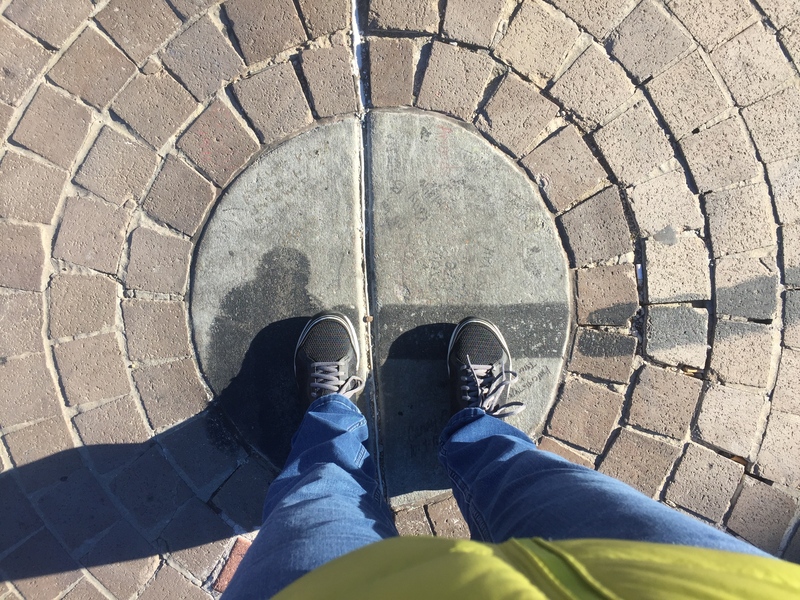 Standing at the Center of the Universe! The Route 66 Marathon/Half Marathon Expo had a few unique features. Instead of handing runners a bag filled with a few samples, we were given reusable shopping bags and directed to tables filled with all sorts of things. I was able to pick from a wide variety of products – cashews, dried cherries, detergents, snack bars, and tissues to name just a few. The volunteers encouraged me to take as many of each as I wanted. It felt like adult trick-or-treat! Like most Expos there were people giving massages and applying sports tape to runners in preparation for race day. 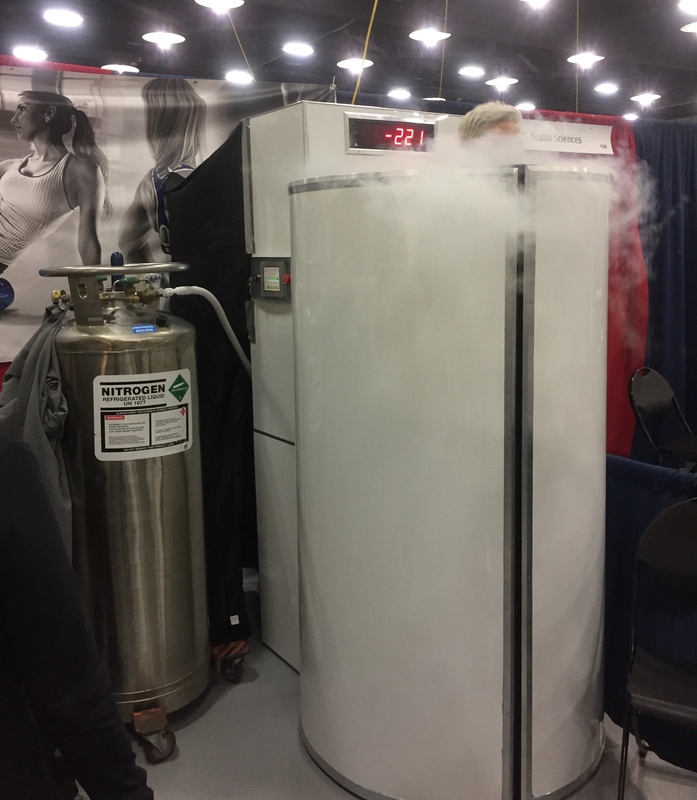 But this Expo also had a therapist offering alternative treatments like cupping and whole body cryotherapy, a procedure where the body is exposed to temperatures below negative 200 degrees F for 2-3 minutes. Yes, I said minus 200 degrees! The purpose of cryotherapy is to reduce muscular and skeletal pain and inflammation – think of a super sized ice bath. I was amazed at the number of people lining up to step into the cryotherapy machine. I was not in pain before the race so I didn’t need to give it a try. For anyone who didn’t find the therapy they needed at the Expo, the local Methodist church hosted a pasta dinner and blessing of the shoes. Given how I fall during training runs, blessing my shoes might have been a good idea. The Route 66 race attracted runners from all 50 states and 10 countries. In fact over 60% of the runners came from outside the Tulsa area. Many of them were repeat runners too. 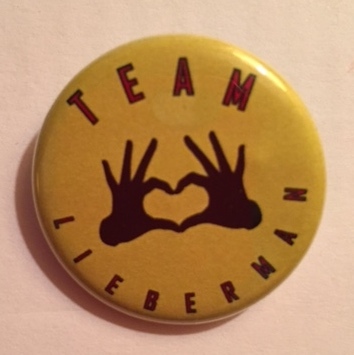 The loyalty runners have to this race is in part due to Chris Lieberman, the race’s Executive Director and visionary who started the race 11 years ago. 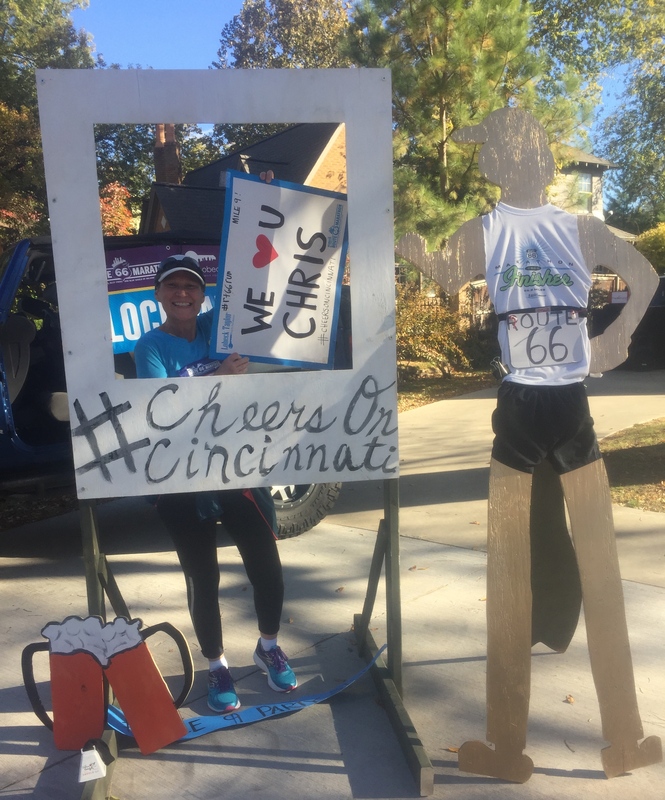 Chris was determined to create a race that showcased Tulsa, gave runners a memorable racing experience while generating revenue for area businesses and charities. In 2015 the race yielded $8 Million in revenue to the city plus nearly $500,000 for area charities. Without Chris, there never would have been a Route 66 race weekend. This year’s race meant even more because Chris fell in March and suffered a traumatic brain injury. Chris wasn’t able to help organize this year’s race. To ensure the race went off without a hitch, race directors from other cities stepped in to lend a hand. The 50 States Marathon Club sold buttons at the Expo with proceeds being donated to help pay Chris’s medical bills. Although Chris was watching the race from his hospital room, he was acknowledged by cheering runners as each corral took off. Can’t say I have ever run past Boozer’s Bend before! One community even changed their name from Cincinnati to “Sin-cinnati” for the day. It was fun to see the neighborhoods cheering the runners. My favorite part of the course was Brookside, an upscale area of shops and restaurants. The cheering spectators there were definitely the loudest and most enthusiastic that I have seen in any race. For many runners a race is all about the bling and the medals from this race were impressive. 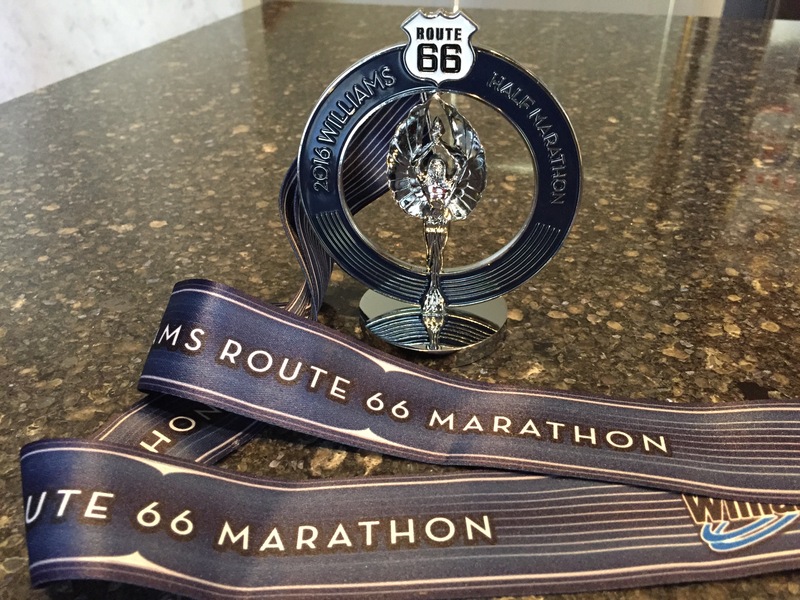 In keeping with the automobile theme, the race medal resembles the hood ornament from a Route 66-era car. There were also special medals for runners completing their first marathon or half marathon – another special touch that I have not seen at any other race. Chris should be proud of his “baby”. The Route 66 Marathon/Half Marathon is a terrific race. I hope that he recovers and is able to be at the start line again soon.